Are 7 seater vehicles going out of fashion, considering that compact SUVs are the need of the hour? Not really. Family cars are making their way back into the Indian market and, as a result, the demand for seven seaters has been on the rise. We've seen a host of carmakers enter this market, right from the Honda BR-V to the second-gen Innova Crysta and the very recent Tata Hexa. The Toyota Innova Crysta has taken over the mantle, from its predecessor, and continues to dominate this market. 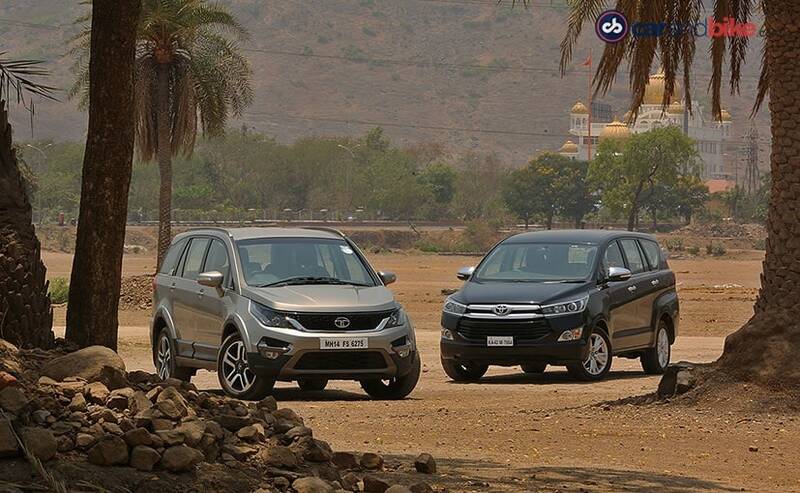 The second generation of the Innova has quite a lot on offer, but the newbie has a lot to prove and that's where Tata Hexa comes into the picture. 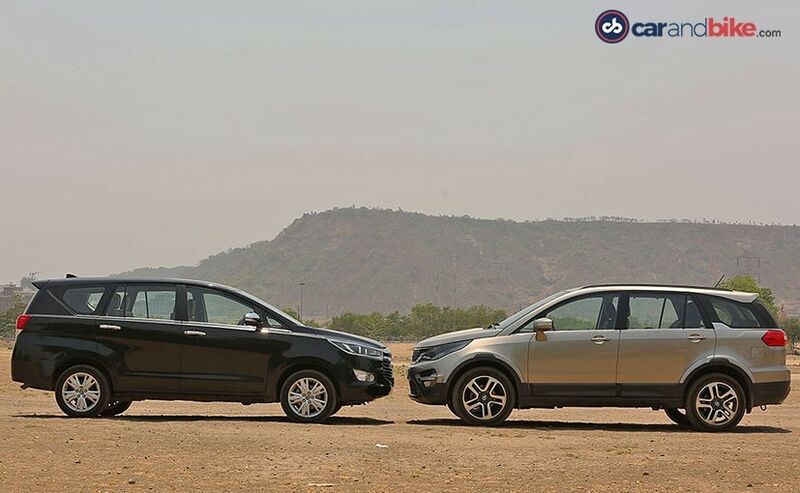 While Tata Motors has clearly stated, time and again, that the main rival of the Hexa is Mahindra's XUV500; yet, the once-in-demand SUV has seen a drop in sales and that's also thanks to the Innova Crysta, which is why it becomes one of the primary contenders to beat. On the one hand, we have the second generation and, on the other, we have a second coming. 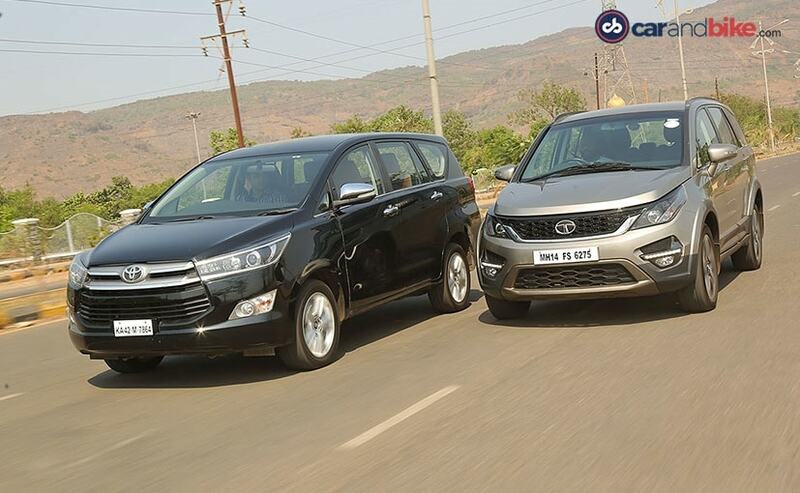 The Innova Crysta has its share of fan following, but it now wants to move on from being an MPV to a more lifestyle oriented SUV, while the newbie Hexa already carries the SUV genes from the Aria and is out there to prove how capable it is. 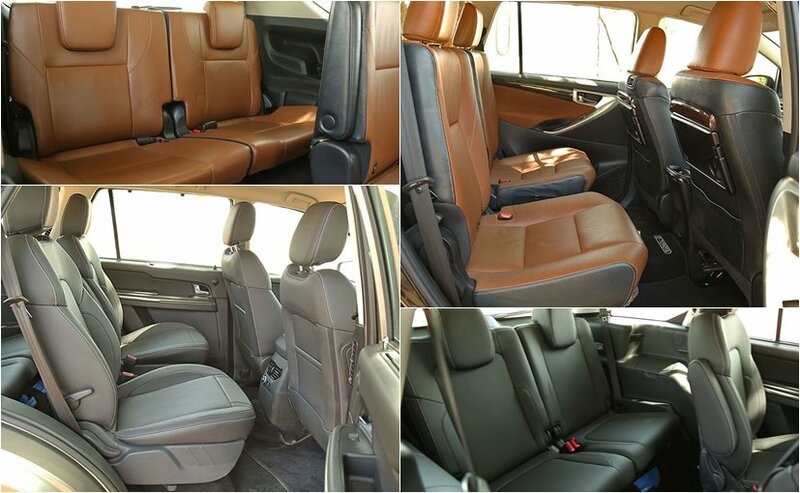 You climb into the Hexa and the first thing you notice is that you get a commanding view, up front, and once you're high up on that mountain, you realise that Tata has really worked on the fit and finish of the interior. It is probably the best we've seen on a Tata product yet. The quality of material used has significantly improved and that's a big take away. 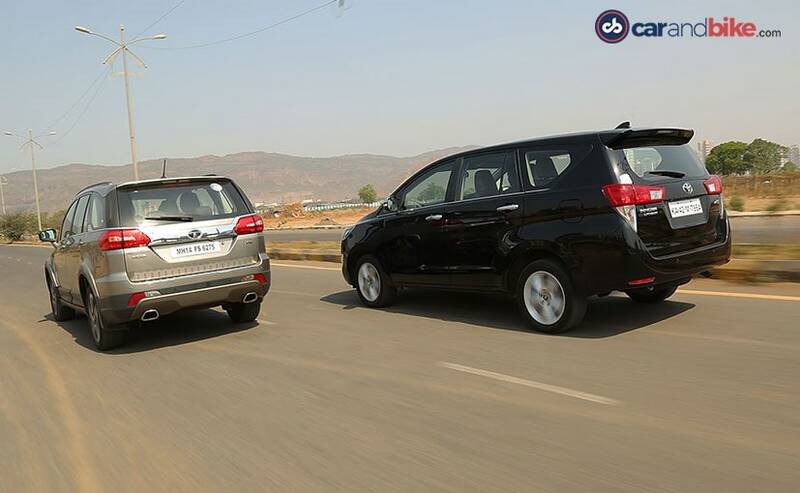 As we moved on to the Toyota, we noticed that the Hexa's overall quality was consistent, when compared to the Innova Crysta. Ergonomically, the Hexa suffers a bit, as it takes some time to figure out the right driving position and, once you're in place, it becomes a task to operate the touchscreen system and air-con controls, as they're placed a bit too low and so you cannot do it while driving, as you have to choose between watching the road and adjusting the air-con. For a big car, the infotainment system is rather too small and it's rather disappointing that it comes sans navigation, considering the price bracket it is in. 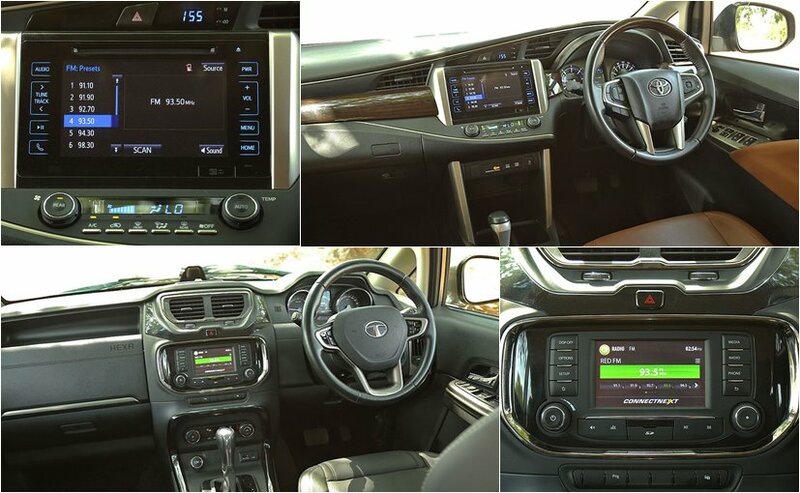 Compared to the Hexa then, the Innova Crysta's dashboard is sophisticated and detailed. It's classy and the attention to detail has to be applauded. The swooping dash is a sight for sore eyes and all the buttons are right there, for your perusal. It's like being handed a silver platter and a spoon. The visibility from the front seat is great and the touchscreen is intuitive to use and displays varied information, like satellite navigation, eco display (which shows how efficiently you are driving), Bluetooth telephony and music system controls. 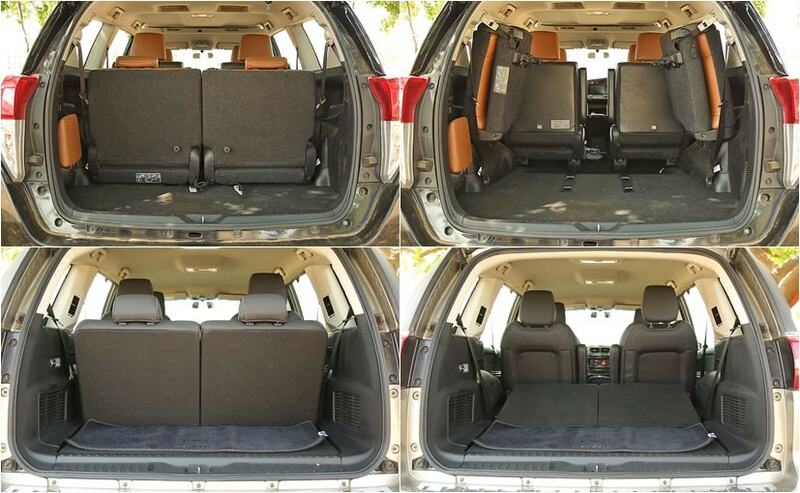 Both cars are equally comfortable up front, but once you get to the middle row, the Innova is the more spacious of the two. We were driving the automatic variants of both cars and they came equipped with captain seats, in the middle row. So even though they're classified as 7 seater cars, both can carry 5 adults and probably 2 kids. The luggage space on offer is fairly good, in both, but the Innova has a lower loading lip and a flat bay, while the Hexa's third row seating, once down, cannot be described as completely flat. The Toyota Innova Crysta wins the battle as far as equipment is concerned, as it sticks to the basics. There's an electrically powered driver's seat, satellite navigation and push button start, all of which go missing on the Hexa. You get 7 airbags on the Innova Crysta, as compared to six on the Hexa and features like Traction control, ESP and Hill Descent Control go missing on the automatic variant of the SUV. Will the Hexa then redeem itself, when it comes to the engine? Well, the engine, under the hood of the Hexa, is the 2.2 litre Varicor, which we've seen on the Safari Storme and this one is more refined and from what we noticed, even quieter. There's 154 bhp, on offer, while the massive 400 Nm of torque is available, from as low as 1800 rpm. The six speed automatic gearbox is pretty good, but takes its time to warm up and wake up, from low speeds, so there is a bit of lag there. The automatic variant does not receive any driving modes, as on the manual, but it does receive a Sports Mode, which basically shifts, at higher rpms, giving you power, in the right bandwidth. The gearshifts are pretty seamless and yes that takes you by surprise. But then, when you are lining up for an overtaking manoeuver, you have to be in the right power band, else it becomes quite a challenge. 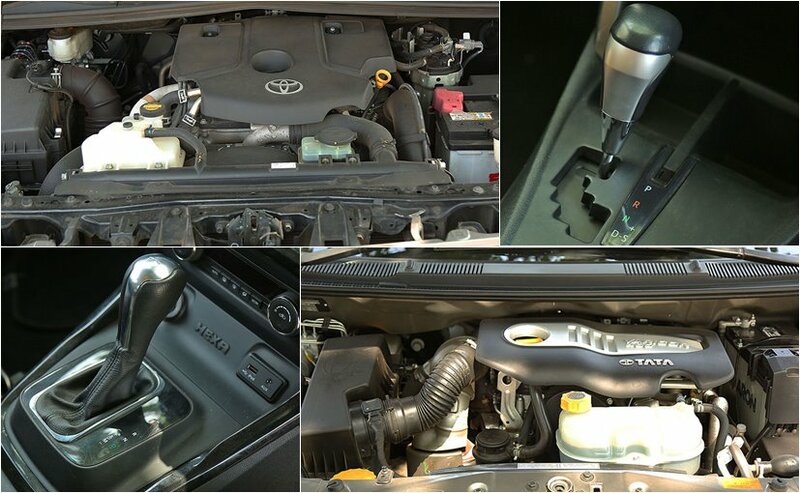 The Innova gets a larger capacity diesel motor, a 2.8 litre to be precise and this one is more close to 20 bhp, more powerful than the engine on the Hexa. 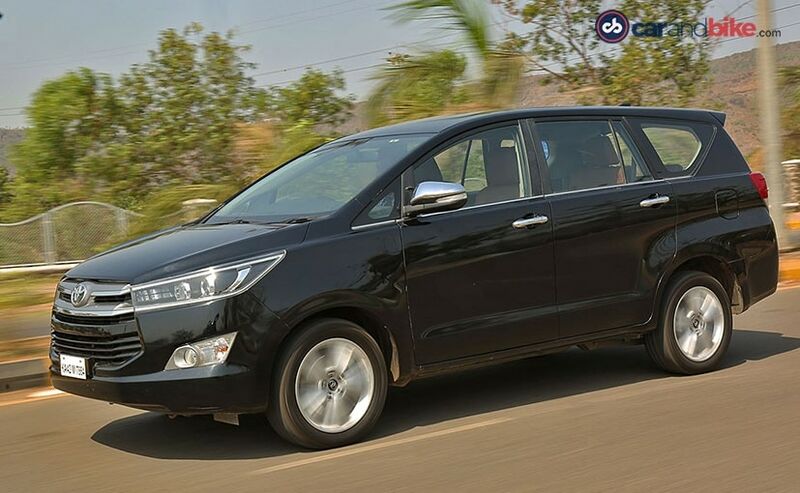 With 171 bhp on offer, the Innova clearly has the advantage, when it comes to power. But, the torque figure is less than that of the Hexa - 360 Nm, but it's the 6 speed automatic gearbox that makes a lot of difference. The gears slot in well and the torque kicks in early too, so there's always power, at your disposal. Unlike the Hexa, there's no hesitation here and the shifts are smooth and effective. Overtaking is effortless and the slow moving traffic is a blur. The Innova Crysta too gets a sports mode, but the shifts here get a bit jerky. On the ride quality. though, the Hexa wins hands down. The long travel of the suspension absorbs all the potholes and is calm and collected as it goes over big bumps. There's no drama or jerks that you feel inside the cabin. The 18 inch tyres cushion you, from all these undulations; and the stability of the car is nothing short of brilliant. The Innova delivers a somewhat pliant ride too; but, when compared to the Hexa, it doesn't quite do the 'ironing out' bit well. The steering is better weighted and the Innova's stiff suspension makes sure that it doesn't roll much, when around a corner, but the Hexa's soft suspension makes a load of difference and there's a fair bit of body roll that you have to tackle. Having said that, the Hexa is always in control and manageable. But finally, it's the price that's the biggest differentiator of all. On the one hand, we have the Innova Crysta ZX automatic variant, which costs ₹ 21.19 lakh, the Hexa XTA variant comes at a price of ₹ 17.4 lakh (both prices, ex-Delhi) and that's a ₹ 4 lakh difference, in price, which is big. While the Hexa wins points for its looks, ride quality and even build quality, it loses points, for the sloppy gearshifts, the lazy engine and even the missing features. The Innova Crysta of course has its own share of issues, but, at the end of the day, it fits the bill. It's more versatile and has been packed to the brim, with features. Add that to Toyota's long standing reputation of bringing in reliable products and great after sales service, as also good resale value and the balance tilts in Innova Crysta's favour. The Hexa, then, is pretty good, but even with the price difference, it clearly isn't good enough!